A research project of the Department of Sociology. Dispersal and regional resettlement policies are an increasingly common response to the challenge of accommodating forced migrants in developed nations, and are employed in both the United Kingdom and Australia to settle people outside of traditional gateway cities. Despite significant differences, including mode of implementation, socio-political context, and target population, the UK and Australian policies have several challenges in common. These include issues of cultural isolation, social and economic integration, and host community reception: issues that can be broadly understood to relate to belonging. Yet despite the challenges to belonging presented by dispersal policies, it remains under-researched in both the UK and Australia. Of particular note is the absence of research on young people. This is critical given the psychosocial vulnerability of adolescent forced migrants, as well as public and policy concerns about marginalised young people. The impact of dispersal and regional resettlement policies on young forced migrants in the UK and Australia is inadequately understood, despite the significant ramifications for both young people and communities. Project findings will inform policy and service interventions that promote wellbeing among forced migrant youth and inform regional, national and international publics. They will also provide insights and knowledge exchange between the UK and Australia about the outcomes of different policies. Belonging is emerging as an important focal point for theorising the asylum-migration-community nexus. Research with young forced migrants in regional cities in two countries provides a unique insight into how local, national and global socio-political contexts intersect to mediate both the affective and political dimensions of belonging. Participatory arts-based research as transformational research praxis has gained increasing recognition over the past decade. Yet such approaches continue to be marginalised within conventional social sciences disciplines. In embedding evaluation into the research process, this project contributes to an emerging evidence base for the intellectual and social value of participatory arts-based approaches. To produce new understandings about the experiences of young forced migrants in dispersal locations. To extend theories and understandings of local belonging within broader processes of multi-scalar and intersectional belonging. To evaluate the effectiveness of participatory arts-based approaches for reflecting, communicating and supporting belonging. To facilitate communication of the experiences of young forced migrants to communities, service providers and policy makers via the creation and presentation of artworks. To support participants and artists in developing new skills and competencies. In-depth semi-structured interviews will be conducted at the beginning and conclusion of the project with 8-12 young forced migrants (aged 15-24) in Newcastle-Upon-Tyne (UK), and the same number in Bendigo (Aus), identified via purposive sampling. Interviews will explore participants’ sense of belonging and evaluate the arts component of the project. A participatory arts project will be conducted in both locations. 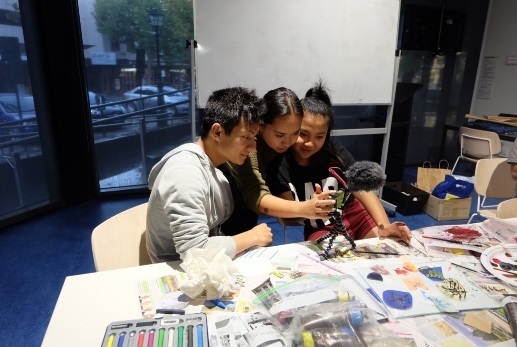 Young forced migrants will participate in workshops with the researcher and community artists, and will be mentored by local artists to produce works that explore their sense of belonging. Works produced in both sites will be curated into multi-arts events and presented to communities, service providers, and policy makers in Newcastle and Bendigo. The works may also be presented as an online exhibition. Project artists will complete regular written or creative diaries reflecting on the research/arts process. They will also participate in end-of-project interviews. 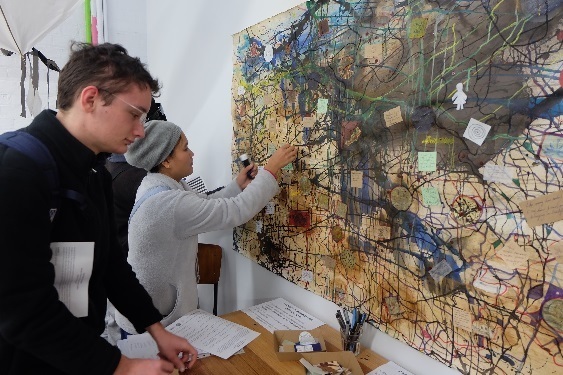 Participant observation and informal discussions will take place throughout the project to capture both the arts/research process and its contribution to ideas and experiences of belonging. A range of evaluation processes, with a focus on participatory and arts-based approaches, will be used to capture participant and artist reflections on the project and to inform how the project develops. The first phase of this study was conducted in Bendigo, Victoria, Australia in 2016. Eight refugee-background young people from the Karen ethnic group of Burma participated in the project. 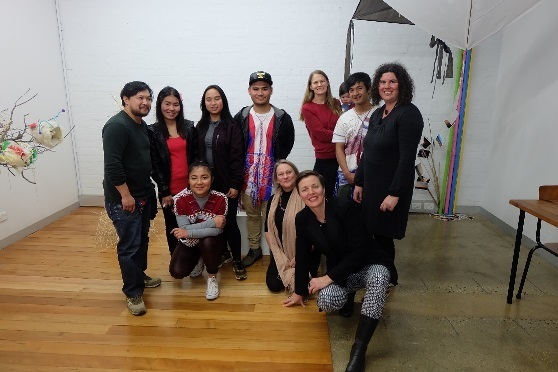 The resulting exhibition, Belonging in Bendigo, was presented as part of Refugee Week celebrations and was featured in a local newspaper. A short video about the project, created with participants, can be viewed here. The U.K. project was conducted in Gateshead, North East England in 2017. Fourteen refugee-background Syrian young people participated in the project. The resulting exhibition, From Syria to Gateshead, was launched at the BALTIC Centre for Contemporary Art and subsequently exhibited at the Shipley Art Gallery as part of Platforma Festival for arts by, about and with refugees and migrants. Findings from the study have been presented at a range of academic and non-academic events, including at migration and refugee studies conferences at Oxford, York and Manchester, at the Gateshead Council Diversity Forum, and for Multicultural Arts Victoria.